One of the biggest events in U SPORTS basketball each year is the Capital Hoops Classic, the annual men’s and women’s clashes at the Canadian Tire Centre (home of the Ottawa Senators) between the Carleton Ravens and their cross-town rivals, the Ottawa Gee-Gees. This year’s Capital Hoops Classic took place Friday in front of a crowd of 9,004, with the No. 3 Ottawa women beating No. 6 Carleton 61-52 and the No. 2 Ravens’ men beating the No. 6 Gee-Gees 82-64. On the women’s side, Ottawa took the trophy for the first time since 2015, but it wasn’t an easy win for them. The Gee-Gees led 13-6 after the first quarter and 29-18 at the half, but the Ravens outscored them 19-10 in the third quarter to cut the deficit to 39-37. The fourth quarter then saw six different lead changes before the Gee-Gees took over for good with just under four minutes to go. Captain Sarah Besselink led the way for Ottawa with 15 points (including nine in the fourth quarter) and eight rebounds, while Brooklynn McAlear-Fanus added 12 points and six rebounds. Angela Ribarich chipped in with 11 points and 11 rebounds, and Jennifer Crowe added eight points, three rebounds and key defensive stops off the bench. After the game, Gee-Gees’ head coach Andy Sparks said the leadership of fifth-year players like Besselink and Crowe was key to helping his team close this one out. “Jennifer Crowe defensively was very big for us and she hit some shots in the first half for us too. Down the stretch, Sarah made a couple big-time fifth-year shots that we needed. That's what veteran leadership is all about, they really stepped up down the stretch." On the men’s side, Carleton started strong with a 7-0 run and took off from there, leading 25-7 after the first quarter and never looking back. 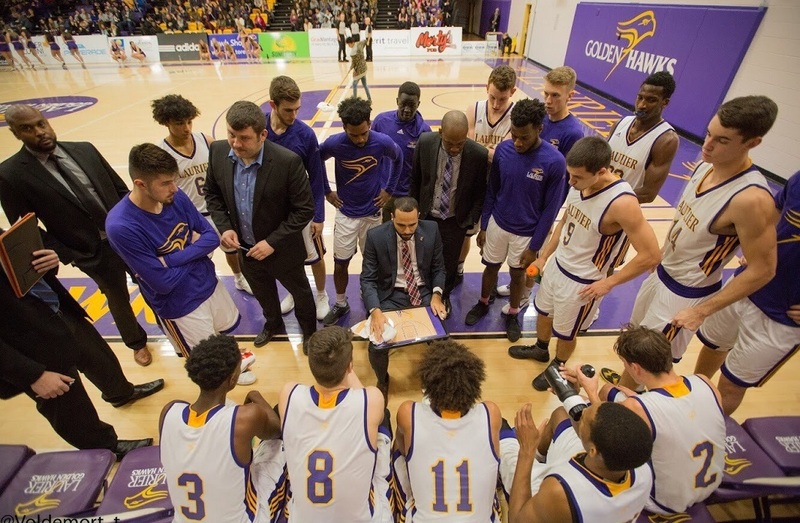 This was a nice bounce-back win for the Ravens, as they lost their first regular-season game in three years against the Ryerson Rams last weekend, and lost the No. 1 ranking to Ryerson as a result.But Carleton was very much back on track Friday against another top-10 team, dominating the game against Ottawa. 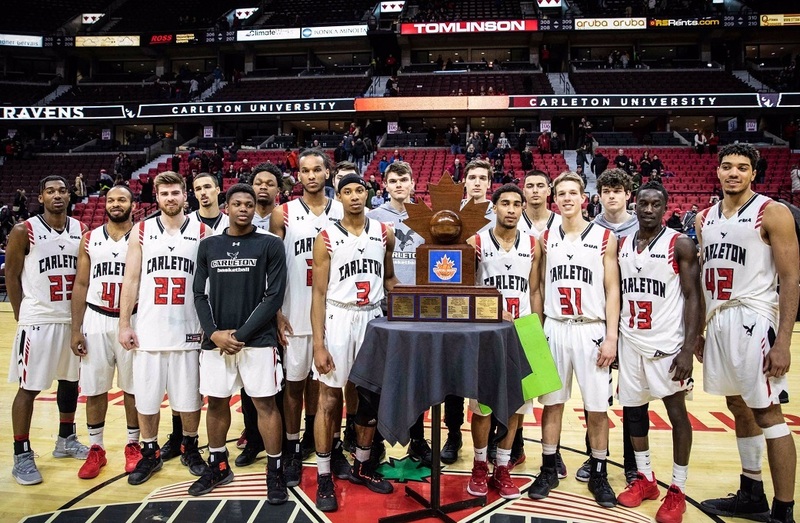 And that result meant that Carleton claimed the men’s Capital Hoops Trophy for the third straight year, pleasing plenty of the fans in attendance. Eddie Ekiyor led the way for the Ravens Friday with 25 points and 12 rebounds (five on the offensive glass), while Marcus Anderson added 14 points, seven rebounds, six assists and five steals. Munis Tutu also chipped in 14 points and six rebounds. For the Gee-Gees, Guillaume Pépin had 17 points and eight rebounds. Carleton’s next game is a road clash against the York Lions in Toronto Friday, while Ottawa heads to Kingston to take on the Queen’s Gaels that same day. Speaking of both the Ravens and of unique event games, Carleton’s men hockey team was involved in one this weekend as well, facing the UQTR Patriotes in Sainte-Tite, Quebec Saturday as part of the Grandes Estrades du Festival de Sainte-Tite and the QMJHL’s own Winter Classic. The ice conditions weren’t perfect, but the Ravens wound up winning 3-1 thanks to goals from Cody Caron, Brent Gustavson and Alex Boivin and a 22-save performance from Francois Brassard. Olivier Caouette scored the Patriotes’ only goal. Afterwards, Ravens’ defenceman Evan de Hann said playing outside was a great experience. Another notable hockey event game this weekend saw the No. 8 McGill Redmen face the Concordia Stingers in the 32nd-annual Ronald Corey Cup, which Concordia won 4-3. Charles-Eric Legaré scored two of the Stingers’ goals, while Philippe Sanche added another and Hugo Roy had the game-winner. McGill defenceman Maximilian Daigle responded with two goals and also added an assist on Samuel Tremblay’s goal, but that wasn’t enough for the Redmen. Anthony Dumont-Bouchard made 25 saves for Concordia, while Louis-Philip Guindon made 35 stops for McGill. The Montreal Carabins hosted the RSEQ swimming championships this weekend, and they came away with both the men’s and women’s titles. Carabins’ swimmers picked up seven medals on the first day of competition and then added 25 on the second day, finishing with 58 overall. On the women’s side, the Carabins wound up with 933.5 points from this meet, which counted for 60 percent of their overall RSEQ championship score and combined with their performance in the four previous RSEQ University Cup meets (199.8 points after multiplying those previous points by 0.40) to give them 759.9 final points overall. The Ottawa Gee-Gees were third going into the RSEQ championships with 82.0 previous points, behind McGill’s 98.2, but picked up 488 points at this meet to the Martlets’ 417 to beat them out for second (374.8 final points to 348.4). On the men’s side, Montreal led with 145.1 points heading into this and picked up 691 in this meet, giving them a final score of 559.7. McGill was second with 127.6 previous points, and the Redmen held onto that slot after earning 677.5 points in this meet. The Laval Rouge et Or were fourth entering this meet with 95.1 previous points (behind Ottawa’s 95.6), but outgained the Gee-Gees 591.0 to 496.5 here to finish in third (449.7 final points to 393.5). Some particularly notable individual performances for the Carabins came from Vincent Laperle (who won the men’s 100m backstroke, setting a RSEQ record with a time of 53.44s (.12 seconds ahead of the old mark), and also placed second in the 200m freestyle ), Ariane Mainville (who won the women’s 50m freestyle and 100m backstroke and was part of the team that won the 4X100m freestyle relay) and Katerine Savard (who won the women’s 200m freestyle, placed second in the 200m butterfly, and was also on that 4X100m freestyle relay team). Other notable individual showings came from McGill men’s swimmers Clement Secchi and Samuel Wang, who finished with three golds each and six and four total medals respectively. "There's some good competitors in this group and the kids fought hard today. We lost a total of seven starters from a year ago between our men's and women's teams, so it was great to see some of the rookies step up and perform well. Garette (Saunders), Roch (Provost) and Calvin (Daum) are three new faces on our men's side and all came up big. Chris McIsaac is a former national champion, but was injured last year, so it was great to see him back in the mix. Those guys really helped make the difference for us. On the women's side, we switched around some weight classes and had some people not in their usual division, but it was a total team effort." Make it four straight for the @BrockBadgers men, who made their way to the top of the podium eight times on Saturday, claiming double-gold for the St. Catharines squad on the mats! Another notable individual showing for the Badgers came from third-year wrestler Hannah Taylor, who won an OUA title for the third straight season after beating Western's Julie Steffler in a tight final in the 59kg division. Taylor was named the event’s Most Outstanding Wrestler on the women’s side. On the men’s side, that award went to Ameen Aghamirian of the McMaster Marauders, who won the 120kg division in a close final against Western's Brayden Ambo. On the team side, Brock finished first on the men’s side with 102 points, while McMaster was second with 73 and the Lakehead Thunderwolves were third with 61. On the women’s side, the Badgers picked up 71 points, while the Gryphons were second with 46 and the Thunderwolves were third with 42. There have been plenty of Canada West schools participating in university curling over the last while, but before this year, curling was last an official Canada West sport for the women in 1983-84 and for the men in 1980-81. That meant that Canada West schools looking to participate in the U SPORTS national championships (around since 2007-08, staged in conjunction with Curling Canada) had to qualify through the Western Canadian University Championships, run by Curling Canada. Curling was added as a conference sport ahead of this year, though, and that led to the University of Alberta hosting the first Canada West curling championships in almost four decades this weekend. And the host Golden Bears and Pandas dominated there, winning both the men’s and women’s titles. On the women’s side, the Pandas’ rink of skip Selena Sturmay (sister to Karsten), third Abby Marks, second Kate Goodhelpsen and lead Paige Papley was also dominant, beating the Regina Cougars 9-4 in the sixth draw to lock up the title with a 4-0 record. Regina would eventually finish second. The top two teams on both the men’s and women’s side will now represent Canada West at the Curling Canada/ U SPORTS Canadian University Curling Championship, held from March 15-19 in Fredericton, NB. But there are some other events ahead for the Alberta curlers; as mentioned in our previous MMQB, the Pandas’ women’s team earned the Canadian women’s junior title last week, and will represent Canada in the World Junior Curling Championships in Liverpool, Nova Scotia from Feb. 16-23. Both Sturmays will also be on the Canadian teams at the Winter Universiade Games in Krasnoyarsk, Russia from March 2-12, and Papley will be an alternate for that women’s team. So there are plenty of top curling competitions ahead for these Alberta student-athletes. Speaking of that Winter Universiade, another student-athlete with ties to the Pandas’ curling team was selected as Canada’s flagbearer this week. That would be Alberta alumna Danielle Schmiemann, who won a U SPORTS curling title for the Pandas last year and also led a Canadian rink to gold at the last Universiade, in Kazakhstan in 2017. Danielle Schmiemann, a été nommée porte-drapeau de la délégation 🇨🇦 se rendant à l’Universiade d’hiver FISU 2019. And speaking of awards, Hockey Canada selected Jayna Hefford, Ken Hitchcock and George Kingston as their Distinguished Honourees of the Order of Hockey in Canada for 2019. All are known for their work with Team Canada and elsewhere, but Hefford and Kingston also have U SPORTS connections, with Hefford playing for the University of Toronto Varsity Blues and Kingston coaching the Calgary Dinos. Longtime Dinos hockey coach George Kingston has been named to the Order of Hockey in Canada. On the subject of the Dinos, their men’s basketball team (ranked third overall nationally) made history this week, capping off just the fifth undefeated regular season in Canada West history (and the first in program history) with a 91-59 win over the Thompson Rivers WolfPack Saturday. 2⃣0⃣-0⃣. Just the fifth undefeated regular season in @CanadaWest history and the first for @UCalgary. And on a more serious note, the Bell Let’s Talk Day Wednesday raised over $7 million for mental health initiatives, and U SPORTS administrators, coaches and athletes took part in both raising money and discussing their personal stories around mental health. Former McMaster athletic director Glen Grunwald (now with Canada Basketball) spoke candidly to Sportsnet’s Michael Grange about his brother Gary (who passed away in September)’s battle with schizophrenia, and many current U SPORTS athletes like UNB soccer player Lauren Kelly and Guelph swimmer Harrison Potvin shared their own stories of dealing with mental health issues. "I wasn’t sure anybody would want me after I hit rock bottom. I saw myself more as a liability than an asset to a team." It’s cool to see how Van Slingerland is using her own experiences with mental health struggles to help others, both through with her work with the CCMHS and with sharing important messages like this.